Buy Bisbee Turquoise Jewelry - Now! Bisbee Turquoise Jewelry has been made since the early 1900's. 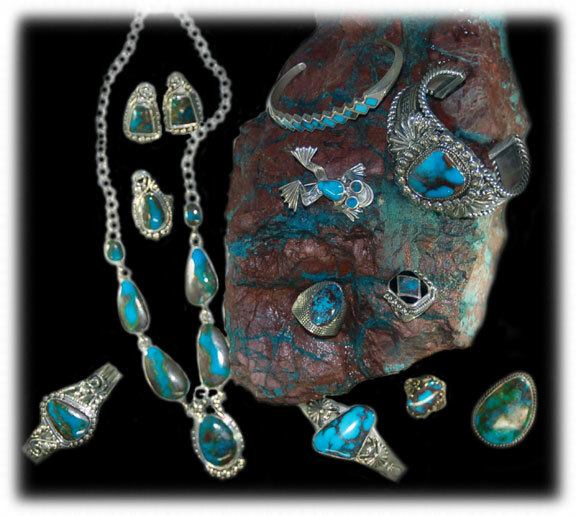 Bisbee Turquoise jewelry can be found in old pawn and dead pawn collections, private collections, museums and in very few highend jewelry galleries today. The majority of Bisbee Turquoise Jewelry that was made in the 1900's was made by Native American jewelers in the Southwest Jewelry style. One of the largest makers of Bisbee Turquoise Jewelry in the 1900's was the Mickelson Jewelry Company who made jewelry for the Bisbee Blue store at the Lavendar pit in Bisbee, Arizona USA. The Mickelson's were relatives of Bob Matthews, the only legal miner of Bisbee Turquoise, and had a large production company in Durango, Colorado. Being the relatives and main supplier of jewelry to Matthew's jewelry store, the Mickelson's recieved most of the high end Bisbee Turquoise to come out of the mine. Durango Silver Company bought what was left of the Mickelson Bisbee Turquoise collection along with all of the equipment and designs. Today, Durango Silver Company is the largest producer of Bisbee Turquoise Jewelry. Bisbee Turquoise Jewelry by Durango Silver Co.
just west of Durango, Co in 1975 and opened for business in 1976 and have been at this location since. We design and make many types of Jewelry these days and we have an online store located at DurangoSilver.com. We invite you to come see our online store and if you are coming to Durango, Co - Come On In! We have tons of sterling silver jewelry with Bisbee Turquoise from Bisbee, Arizona. We specialize in Sterling Silver Jewelry Rings, Earrings, Pendants, and Bracelets with highgrade American Turquoise. 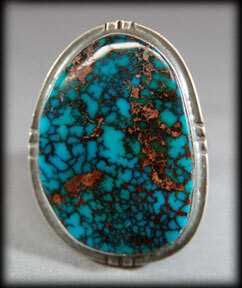 We have one of the largest collections of AUTHENTIC Bisbee Turquoise Jewelry in the United States. We try hard to have a very diverse selection of turquoise and gemstone jewelry. We design jewelry in classic southwestern, victorian and contemporary jewelry designs.